The present study investigates the regulatory mechanisms involved in the cooperation between IFN-γ and TNF-α to promote transcription from IFN regulatory factor-1 (IRF-1). A transient transfection analysis revealed that the region between −218 and −144, where +1 is the transcription start site, as well as previously reported downstream elements, ppκB and IFN-γ activation site/κB, were required for the optimal response to the two cytokines. A subsequent DNase I footprint analysis showed that the region between −171 and −144 was inducibly protected with stimulation by TNF-α, and this protection was significantly enhanced with the combination of IFN-γ and TNF-α. In an EMSA with the protected region as a probe, a TNF-α-inducible complex (C1) and an IFN-γ-inducible complex (C2), but no synergy-specific DNA-protein complexes, were recognized. The C1 complex consisted of a pre-existing factor (p65/p50), whereas the C2 complex consisted of a newly synthesized IRF-1-related factor. A methylation interference assay revealed the critical G residues (from −167 to −151) for the DNA-protein complex formation specific to the cytokine response, and within this region the novel κB sequence, the promoter distal κB (pdκB) element (5′-GGGGAAGTAC-3′), was identified. Because the base substitutions over the pdκB region (from −171 to −144) affected not only the TNF-α-response but also that of IFN-γ, this region might contribute to the cooperative action of the NF-κB subunits with the IRF-1-related factor. Finally, we demonstrated that none of the cis-acting elements, ppκB, pdκB, or IFN-γ activation site/κB, is dispensable for the optimal synergism in response to IFN-γ and TNF-α. Inteferon-γ and TNF-α are cytokines that have pleiotropic effects on inflammation, immunomodulation, and hemopoiesis (1, 2, 3, 4, 5, 6). Besides their potency, their synergistic effects on many biological situations have drawn the attention of immunologists to the molecular mechanism of how one cytokine modulates the effect of another. One of the mechanisms that operates such synergism can be attributed to the level of transcription of the target genes. Indeed, synergistically induced transcription of a set of target genes by IFN-γ and TNF-α has been reported (7, 8, 9, 10, 11, 12, 13). Among them, the IFN regulatory factor-1 (IRF-1)3 gene has been analyzed extensively because of its immunological importance (12, 13). IRF-1 was initially described as a positive transcription factor for the regulation of type I IFN and IFN-inducible genes (14, 15, 16). However, a gene-targeting experiment with IRF-1 revealed the essential roles of IRF-1 in many biological settings: the differentiation of CD8+ T cells, Th1 subsets, NK cells, and NK1.1+ T cells; the transcriptional regulation of low-molecular mass polypeptide 2 TAP1, and IL-15; and the regulation of DNA damage repair, apoptosis, and oncogenesis (17, 18, 19, 20, 21, 22, 23). Thus, the role of IRF-1 is not restricted to the IFN system, but, rather, is more broadly involved in the host defense mechanism than previously proposed. The IRF-1 gene is induced by IFN-γ and TNF-α through the activation of cellular transcription factors as a consequence of signal transductions initiated at the plasma membrane. In IFN-γ signaling, it triggers the phosphorylation of STAT1 via activation of the Janus family tyrosine kinases, JAK1 and JAK2. Tyrosine-phosphorylated STAT1 assembles to form a homodimer, which then translocates into the nucleus and binds to a specific DNA sequence motif, termed the IFN-γ activation site (GAS) (24, 25). In contrast, stimulation by TNF-α leads to the activation of a latent form of NF-κB in the cytoplasm by dissociation of its inhibitor IκB, which was inducibly phosphorylated and then directed to the ubiquitin-dependent proteolysis pathway (26, 27). The released NF-κB then translocates into the nucleus and binds to a specific DNA sequence motif, termed the κB element (28). The IRF-1 gene promoter has been described as containing a composite GAS/κB element between −126 and −112 and a promoter-proximal κB element (ppκB) between −49 and −40 (29, 30). However, the molecular mechanism for the synergistic induction of IRF-1 does not seem to be fully elucidated, as previous studies demonstrated that point mutations of these elements reduced, but did not completely eliminate, the synergistic response to IFN-γ and TNF-α (12). Thus, we speculated that although the composite GAS/κB and ppκB are important, other unidentified cis-acting elements of IRF-1 also contribute to the synergism. To address this issue, we analyzed the promoter of human IRF-1, positions −491 to +105, under the stimulation of IFN-γ and TNF-α. We extensively used the cell line AS-E2 (31, 32, 33), because the limited basal level of IRF-1 transcription in this cell line is dramatically increased by IFN-γ and TNF-α and thus allowed us to define the responsive elements of the IRF-1 promoter precisely. We performed transient transfection assays and EMSA to identify the cis-acting element(s) involved in this synergism in the IRF-1 promoter. With DNase I protection analysis, we found a region with enhanced protection from the digestion between −171 and −144 (pdκB region) upon costimulation by both cytokines. Further DNA-protein interaction analyses indicated that multiple constitutive and inducible factors bind to the pdκB region, and point mutations in this region reduced the IRF-1 promoter response to the cytokines. We found that the synergistic induction of IRF-1 gene expression by IFN-γ plus TNF-α was reduced with point mutations of any of three cis-elements and was abolished with either the combined mutations of the pdκB region and GAS/κB or pdκB and ppκB. In a heterologous promoter, the SV40 early promoter, we demonstrated that pdκB alone did not function as an enhancer, but did so in the presence of GAS/κB. The function of pdκB was also demonstrated in the U937 and K562 cell lines. RPMI 1640 medium, IMDM, and FCS were purchased from Life Technologies (Rockville, MD). Purified recombinant human TNF-α and IFN-γ were purchased from Roche (Mannheim, Germany). Purified recombinant human erythropoietin (Epo) was provided by Kirin Brewery (Tokyo, Japan). AS-E2 cells were maintained in IMDM supplemented with human recombinant Epo (2 U/ml), FCS (20%, v/v), 100 μg/ml penicillin, and 50 μg/ml streptomycin in a 37°C incubator with 5% CO2 and 100% humidity. U937 and K562 cells were maintained in RPMI 1640 medium supplemented with 10% FCS. Total cellular RNA was isolated from AS-E2 cells, which were either unstimulated or stimulated by IFN-γ (100 U/ml) and/or TNF-α (20 ng/ml) for 3 h, using the RNeasy Mini Kit (Qiagen, Hilden, Germany). The isolated RNAs were electrophoresed in a 1% agarose gel containing 18% formaldehyde and were transferred to a Hybond N membrane (Amersham, Aylesbury, U.K.). The membrane was prehybridized in 50% formamide, 0.5 M NaH2PO4, 2.5 mM EDTA, 5% SDS, 5× Denhardt’s solution, and 100 μg/ml salmon sperm DNA at 42°C for 2 h and was subsequently hybridized under the same conditions with a 379-bp human IRF-1 cDNA as a probe. This probe was obtained by RT-PCR with the primer set 5′-TTCCCTCTTCCACTCGGAGT-3′ and 5′-GATATCTGGCAGGGAGTTCA3′. The hybridization signals were visualized by an image analyzer (Fuji Film, Tokyo, Japan) and were quantitated with MacBAS (version 2.4) software (Fuji Film). A human genomic library, constructed in λDASH II (provided by the Human Genome Center, Institute of Medical Research, University of Tokyo, Tokyo, Japan), was screened by plaque hybridization using the IRF-1 cDNA used for the Northern blot analysis as a probe. Following hybridization at 65°C overnight in 6× SSPE, 0.5% SDS, 5× Denhardt’s solution, 50% formamide, and 100 μg/ml denatured salmon sperm DNA, the filters were washed with 2× SSC containing 0.1% SDS at 65°C for 15 min several times. The 1932-bp HindIII fragment corresponding to the region from −491 to +1441 of the IRF-1 gene was purified from the positive clones, and then was inserted into the pBluescript II SK+ plasmid. The resultant plasmid, BskIRF-1, was used to construct luciferase reporter plasmids. To construct the plasmid pGL2IRF-1, a 999-bp KpnI-BglII fragment containing the region from −491 to +472 of the IRF-1 genomic DNA was excised from BskIRF-1 and then was subcloned into the luciferase reporter plasmid, pGL2-Basic (Promega, Madison, WI). The region from +106 to +469 was removed from the resultant plasmid pGL2IRF-1 by AflII and BglII digestions, followed by self-ligation to yield the plasmid, −491Luc. 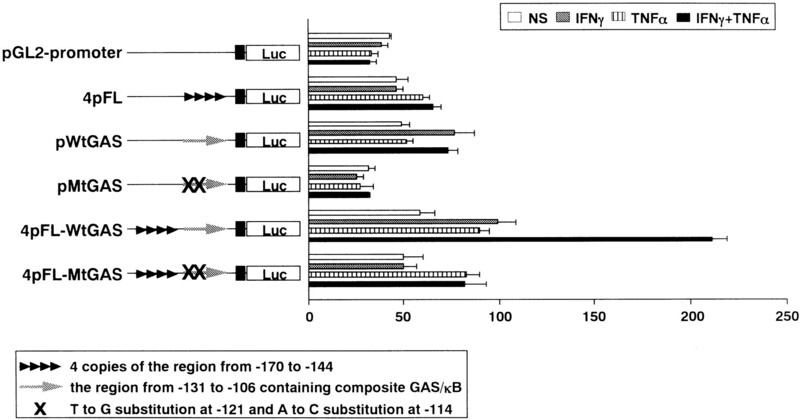 The regions from −491 to −334, −219, −144, and −58 were removed from the plasmid −491Luc by KpnI and BstXI, ApaI, NheI, and FseI digestions, followed by self-ligations to yield the plasmids −333Luc, −218Luc, −143Luc, and −57Luc, respectively. To construct substitution mutants, the 282-bp EagI fragment corresponding to the region from −192 to +90 was excised from pGL2IRF-1 and was subcloned into pBluescript II SK+. The resultant plasmid, BskEag, was used as the template to yield the plasmids, BskpmtEag (bearing C to A substitutions at −157, −154, and −153; pmt), BskdmtEag (bearing C to A substitutions at −167 and −166 and a G to T substitution at −165; dmt), BskmtGASEag (bearing A to C substitutions at −115 and −114), and BskmtNF-κBEag (bearing a G to T substitution at −48 and a C to A substitution at −41, respectively) using the QuickChange site-directed mutagenesis kit (Stratagene, La Jolla, CA). After verification by sequencing, the region from −192 to +90 was excised from BskpmtEag, BskdmtEag, BskmtGASEag, and BskmtNF-κBEag by EagI and was replaced with the corresponding region of the plasmid −491Luc, respectively. To construct the plasmid −491 mtGASpmtLuc, the KpnI-NheI fragment of −491 mtGASLuc was replaced with the corresponding fragment of −491 pmtLuc, and to construct the plasmid −491 mtNF-κBpmtLuc, the KpnI-NheI fragment of −491 mtNF-κBLuc was replaced with the corresponding fragment of −491 pmtLuc. To construct the plasmid, pWtGAS, we prepared oligonucleotides corresponding to the sequence (−131 to −106) of IRF-1, with flanking sequences for restriction enzymes, KpnI and BglII (sense, 5′-CAGCCTGATTTCCCCGAAATGACGGCcga-3′; antisense, 5′-gatctcgGCCGTCATTTCGGGGAAATCAGGCTGgtac-3′). Each oligonucleotide was phosphorylated by polynucleotide kinase (TaKaRa, Tokyo, Japan), annealed, and inserted between the KpnI and BglII sites of the pGL2-Promoter (Promega). Similar oligonucleotides, but with the replacement of T at −121 by G and A at −114 by C, were used to construct the plasmid, pMtGAS. To construct the plasmid, 4pFL, we prepared oligonucleotides corresponding to the pdκB region (−170 to −144) of IRF-1, with flanking SpeI restriction enzyme sites (sense, 5′-ctagtCAGCCGCCCTGTACTTCCCCTTCGCCGa-3′; antisense, 5′-ctagtCGGCGAAGGGGAAGTACAGGGCGGCTGa-3′). After the kinase reaction, the oligonucleotides were annealed, ligated with T4 DNA ligase to obtain four concatemers of the pdκB region with the same directional alignment, and then subcloned into the SpeI sites of pBluescript II SK+. From the resultant plasmid, Bsk4c, the XbaI-SmaI fragment containing the concatemers was excised and subcloned between the NheI and SmaI sites of the pGL2-Promoter plasmid to produce 4pFL. The same XbaI-SmaI fragment was also used to construct 4pFL-MtGAS. To construct 4pFL-MtGAS, the concatemer fragment was blunt ended with the Klenow enzyme (TaKaRa) and was subcloned into the SmaI sites of pMtGAS. To construct 4pFL-WtGAS, the pWtGAS plasmid was digested with SmaI and HindIII. The fragment containing the wild-type GAS and the SV40 early promoter was purified and subcloned between the BglII site (which had been bluntended with the Klenow enzyme) and the HindIII site of the 4pFL plasmid. To construct a plasmid expressing the Renilla luciferase under the control of the human β-actin promoter, the plasmid pRL-SV40 (Promega) was digested with XbaI and HindIII, and the XbaI site was blunt ended with the Klenow enzyme. The fragment containing the Renilla luciferase-coding region was purified and was subcloned between the HindIII and BamHI sites, the latter of which had been blunt ended with the Klenow enzyme of the plasmid pHβApr-1 (34). The resultant plasmid, pRLβactin, was used as an internal control for the luciferase assay. Cultured cells (3 × 106) were cotransfected with 5.91 μg of each luciferase reporter plasmid and 0.09 μg of the internal control vector by the TransFast reagent, according to the manufacturer’s recommendations (Promega). The transfected cells were stimulated by IFN-γ (100 U/ml) and/or TNF-α (20 ng/ml) for 3 h after 48 h post-transfection. The luciferase assays were performed with the dual luciferase assay system, according to the manufacturer’s recommendations (Promega). To normalize the transfection efficiency, the net firefly luciferase activity (the activity of the reporter transfectant − the activity of the nontransfectant) × 1000 was divided by the net Renilla luciferase activity (the activity of the reporter transfectant − the activity of the nontransfectant) from the internal control vector. Each result is presented as the mean ± SE from three independent experiments. Nuclear extracts were prepared according to the method of Schreiber et al. (35). Briefly, 8 × 106 cells, either unstimulated or stimulated by IFN-γ and/or TNF-α for 3 h, were washed three times with ice-cold Tris-buffered saline, suspended in 800 μl of buffer A (10 mM HEPES-KOH (pH 7.9), 10 mM KCl, 0.1 mM EDTA, 1 mM DTT, and 0.5 mM PMSF), and incubated on ice for 15 min. The cells were then lysed in the presence of 0.6% Nonidet P-40 by vortexing for 10 s. The nuclei were collected by centrifugation for 15 s and were suspended in 100 μl of buffer C (20 mM HEPES-KOH (pH 7.9), 400 mM NaCl, 1 mM EDTA, 1 mM DTT, and 1 mM PMSF) at 4°C for 15 min. The nuclear extracts were recovered after centrifugation at 15,000 rpm for 5 min and were stored at −80°C. The plasmid pGL2IRF-1 was digested with BstXI and SacI and was blunt ended with T4 DNA polymerase. The 335-bp DNA fragment containing the region from −333 to +2 of the IRF-1 promoter was then purified and subcloned into the SmaI site of pBluescript II SK+. The resultant plasmids, which contained the 335-bp fragment in either direction, were digested with NotI and EcoRV, respectively. The 380-bp DNA fragments were purified and labeled with the Klenow enzyme and [α-32P]dCTP. The nuclear extracts were concentrated with ammonium sulfate and dialyzed against buffer D (10 mM HEPES-KOH (pH 7.9), 100 mM NaCl, 0.5 mM EDTA, 10% glycerol, 0.5 mM DTT, and 0.5 mM PMSF). The protein concentration of each dialysate was adjusted to 4.5 mg/ml with buffer D. The binding reactions were conducted in 22 μl with 2 μg of poly(dI-dC)·poly(dI-dC) and 0, 10, or 20 μl of the protein solution supplemented with buffer D. After a 20-min preincubation on ice, the end-labeled probe (10,000 cpm) was added. The binding reactions were performed at room temperature for 30 min. The mixtures were then digested for 1 min by the addition of 5 μl of a DNase I digestion mixture (5 mM CaCl2, 10 mM MgCl2, and 0.5–1.5 U of RQI RNase-free DNase (Promega) using the same buffer conditions as those used for the binding reactions). The digestion was terminated by the addition of 52 μl of a stop solution (50 mM EDTA, 0.1% SDS, 100 μg/ml yeast transfer RNA, and 0.8 mg/ml proteinase K), extracted with phenol, and then precipitated twice with ethanol. The pellets were suspended in 6 μl of loading buffer (0.1% bromophenol blue, 0.1% xylene cyanol, and 90% formamide in 1× TBE buffer) and were electrophoresed on a 5% sequencing gel. The gel was dried and analyzed by the image analyzer. Wild-type oligonucleotides corresponding to the region from −183 to −137 of the IRF-1 promoter were synthesized and annealed. The dsDNA was labeled by a filling-in reaction at the 5′-G overhangs with the Klenow enzyme and [α-32P]dCTP. Oligonucleotides containing the mutations of dmt or pmt (see above) were also synthesized and annealed. Binding reactions were conducted with 1 μl of nuclear extracts in a 10-μl reaction under the conditions of 10 mM HEPES-KOH (pH 7.9), 100 mM NaCl, 0.5 mM EDTA, 0.5 mM DTT, 0.5 mM PMSF, 10% glycerol, and 100 μg/ml poly(dI-dC)·poly(dI-dC). In some cases, a 10-fold molar excess of nonradiolabeled dsDNA was included as a competitor. Competitor oligonucleotides used in this study were as follows. WtGAS contained the region from −131 to −106 of the IRF-1 promoter, while MtGAS contained the same region, except for a T to A substitution at −121 and an A to C substitution at −114. WtNF-κB contained the region from −54 to −35 of the IRF-1 promoter, while MtNF-κB contained the same region, except for a G to T substitution at −48 and a C to A substitution at −41. WtISG54 contains the region from −102 to −87 of the ISG54 promoter, while MtISG54 contained the same region except for a T to A substitution at −98 and a T to G substitution at −97. IRF-1 and ISGF3 were shown to bind to the WtISG54, but not to the MtISG54 (36). The dmt competitor contained from −183 to −137 of the IRF-1 promoter with C to A substitutions at −167 and −166, and a G to T substitution at −165. The pmt competitor contained from −183 to −137 of the IRF-1 promoter with C to A substitutions at −157, −154, and −153. After a 20-min preincubation on ice, the end-labeled probe (10,000 cpm) was added. The binding reactions were performed at room temperature for 30 min. In some cases the reactions were further incubated with anti-p50, anti-p65, anti-IRF-1, or anti-p48 polyclonal Abs (Santa Cruz Biotechnology, Santa Cruz, CA) at room temperature for 30 min. The binding reactions were mixed with 1 μl of loading buffer (0.1% bromophenol blue in the same buffer used for the binding reactions) and then were electrophoresed on a nondenaturing 5% polyacrylamide gel with 0.5× TBE at room temperature. The gels were dried and analyzed by the image analyzer. In the kinetic assay, 10 μg/ml of cycloheximide was added when the cells were stimulated with the cytokines. Where indicated, we quantified the signals of the complexes with MacBAS (version 2.4) software. The coding or the noncoding strand of the wild-type oligonucleotides used in EMSA was labeled with T4 polynucleotide kinase and [γ-32P]ATP before annealing with the unlabeled complementary strand. Each end-labeled dsDNA was partially methylated with dimethyl sulfate as previously described (37) and was electrophoretically purified from a nondenaturing polyacrylamide gel with Qiaex II (Qiagen). The binding reactions were performed as described above, except for scaling up proportionally in a 300-μl reaction volume. Free and bound DNAs were recovered with Qiaex II after resolution by gel electrophoresis and image analysis. The purified DNAs were suspended in 1 M piperidine and were incubated at 90°C for 30 min. The DNAs were lyophilized, suspended in 10 μl of the loading buffer used in DNase I footprint analysis, and electrophoresed on a 15% sequencing gel. The gels were dried and analyzed by the image analyzer. To determine whether IRF-1 is induced by IFN-γ and/or TNF-α in AS-E2 cells, we first quantified IRF-1 mRNA by Northern blotting. 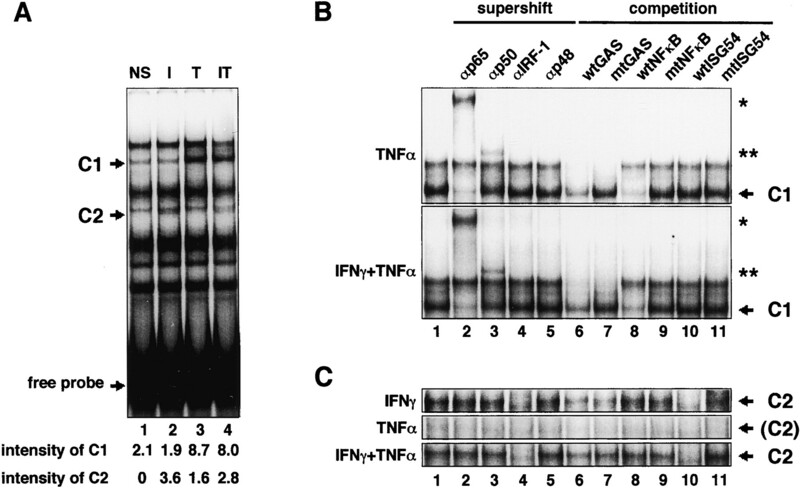 IRF-1 mRNA was increased 25-fold by IFN-γ (Fig. 1⇓A, lane 2). 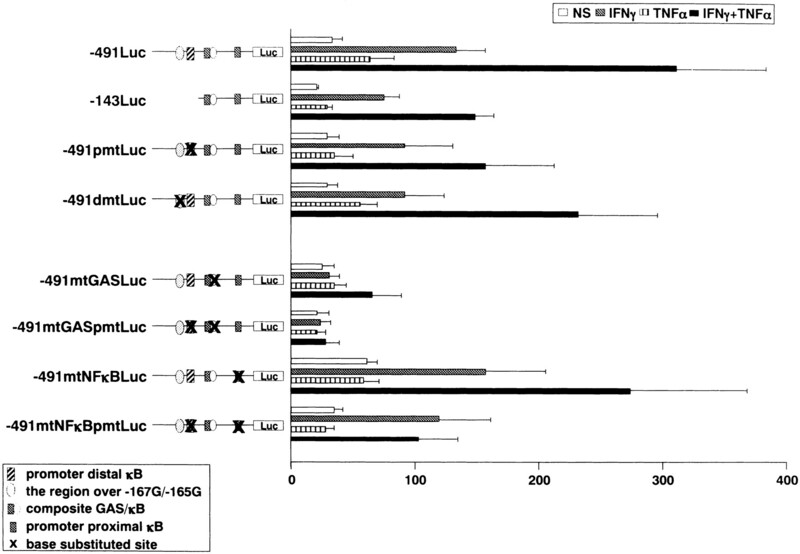 Although TNF-α alone caused only a 7-fold increase in IRF-1 mRNA (Fig. 1⇓A, lane 3), it augmented the amount of IRF-1 mRNA by 35-fold in combination with IFN-γ (Fig. 1⇓A, lane 4). This result suggests that IRF-1 transcription is synergistically induced by IFN-γ and TNF-α in AS-E2 cells. However, we could not exclude the possibility from the Northern blotting data that the cytokines also affect IRF-1 mRNA stability. Synergistic induction of IRF-1 by IFN-γ and TNF-α, revealed by Northern analysis. A, Total cellular RNA was isolated from AS-E2 cells, either unstimulated (lane 1) or stimulated by IFN-γ (lane 2), TNF-α (lane 3), or both (lane 4) for 3 h and was hybridized with the IRF-1 probe (upper panel) and the β-actin probe (lower panel). Similar results were obtained in three independent experiments. 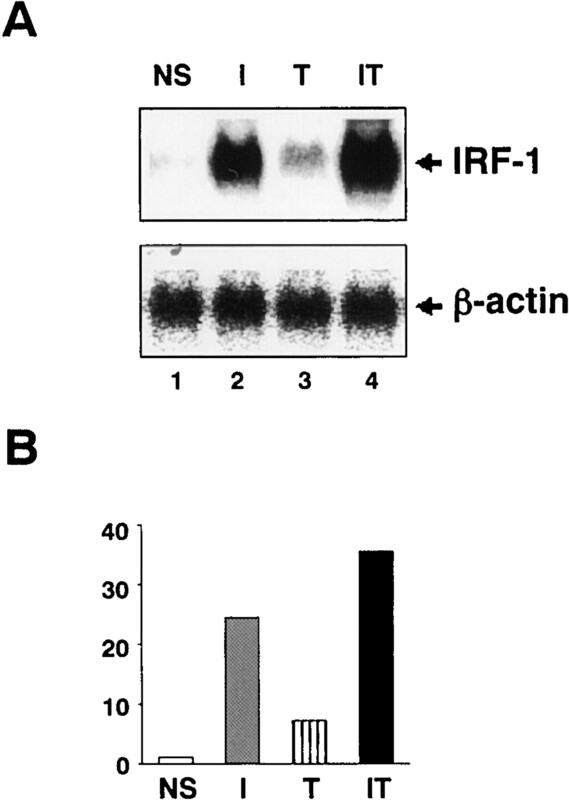 B, IRF-1 mRNA levels were quantitated by a densitometer and were normalized to β-actin mRNA. The graph shows the relative amount of IRF-1 mRNA induced after stimulation with IFN-γ, TNF-α, or both cytokines. To identify the IRF-1 promoter region responsible for the synergistic induction by IFN-γ plus TNF-α, we first used the reporter plasmid −491Luc, which contains both the GAS/κB and the ppκB elements (Fig. 2⇓). This construct was transiently transfected into AS-E2 cells with an internal control vector. Because the Renilla luciferase activity driven by the SV40 enhancer and early promoter was found to be stimulated by TNF-α (data not shown), we used the plasmid pRLβactin, which stably produces the Renilla luciferase regardless of the presence of TNF-α. As shown in Fig. 2⇓, the luciferase activity from the plasmid −491Luc was stimulated 2.5-fold by IFN-γ and 2-fold by TNF-α. In the presence of both cytokines, however, the activity was augmented 10-fold, indicating that the transcriptional synergism could be firmly detected by this reporter system. Similar activation profiles were obtained with the mutants of the IRF-1 promoter deleted to −219 (Fig. 2⇓, −333Luc and −218Luc), which was consistent with previous studies (12, 13). When the promoter was further deleted to −58 (-57Luc) but still included the ppκB element, the basal promoter activity was impaired, the response to IFN-γ was lost, and the response to TNF-α became marginal. Thus, the sequence including the GAS/κB element is essential for both basal and IFN-γ-dependent promoter activities. Remarkably, when the deletion construct −143Luc (where both the GAS/κB and the ppκB elements were intact) was used, the response to TNF-α was abolished along with the reduction of the response to IFN-γ and the two cytokines. These results suggest that an unidentified functional element(s) responsible for the stimulation by IFN-γ and TNF-α resides in the region between −218 and −144. Reporter assay of IRF-1 promoter deletion mutants. The structures of the IRF-1 promoter in the reporter plasmids are depicted at the left. The composite GAS/κB element, located between −126 and −112, and the promoter proximal κB element, located between −49 and −40, are indicated. The number for each reporter plasmid corresponds to the 5′ border of the IRF-1 promoter. At 48 h post-transfection the cells were stimulated for 3 h by IFN-γ, TNF-α, or both, and then promoter activity was measured as was luciferase activity. Firefly luciferase activity was normalized to Renilla luciferase activity from the internal control plasmid transfected simultaneously. Each column represents the mean from three independent experiments with SE bars. The IRF-1 promoter analysis described above suggests that the promoter region from −218 to −144 serves as a positive cis-acting element for IFN-γ and TNF-α stimuli. To examine whether any trans-acting factor is induced to bind within this region upon stimulation by IFN-γ and TNF-α, we performed DNase I footprint experiments. No significant changes in the DNase I digestion pattern were observed with unstimulated (Fig. 3⇓, lanes 2, 3, 15, and 16) and IFN-γ-stimulated (Fig. 3⇓, lanes 5, 6, 18, and 19) nuclear extracts. However, a weak, but distinct, footprint was detected over −166 to −144 of the coding strand when cells were stimulated by TNF-α (Fig. 3⇓, lane 9). Significantly, the protection, over −166 to −144 of the coding strand and over −171 to −145 of the noncoding strand, was enhanced unambiguously by the simultaneous IFN-γ and TNF-α stimulation (Fig. 3⇓, lanes 12 and 25). These data indicate that a TNF-α-inducible factor binds to the region between −171 and −144, and the binding is enhanced by costimulation with IFN-γ. DNase I footprint analysis with the nuclear extracts from cells unstimulated or stimulated with IFN-γ and TNF-α. The DNase I protection patterns for the coding strand (lanes 1–13) and for the noncoding strand (lanes 14–26) with no protein (lanes 1, 4, 7, 10, 13, 14, 17, 20, 23, and 26) and 45 μg (lanes 2, 5, 8, 11, 15, 18, 21, and 24) or 90 μg (lanes 3, 6, 9, 12, 16, 19, 22, and 25) of nuclear extracts prepared from the cells unstimulated (lanes 2, 3, 15, and 16) or stimulated with IFN-γ (lanes 5, 6, 18, and 19), TNF-α (lanes 8, 9, 21, and 22), or both (lanes 11, 12, 24, and 25) for 3 h are shown. The regions protected from DNase I digestion are indicated as boxes with the corresponding nucleotide numbers. Similar results were obtained in three independent experiments. Next we performed an EMSA using a probe containing the protected region in the DNase I footprint analysis. We found that TNF-α stimulated the formation of a complex, designated C1 (Fig. 4⇓A, lane 3), which was originally detected as a faint complex without the cytokine stimulation (lanes 1 and 2). This complex, however, was not induced further by simultaneous stimulation by TNF-α and IFN-γ (Fig. 4⇓A, lane 4). Instead, another complex, designated C2, appeared in an IFN-γ-specific manner (Fig. 4⇓A, lanes 2 and 4). The complex directly above C2 was nonspecific, as its appearance was not consistent. To clarify the factors contributing to C1 and C2 complex formation, we applied the oligomer competitors or Abs to another batch of independently prepared nuclear extracts. The mobility of the C1 complex was shifted in the presence of Abs against either the p65 or p50 subunit of NF-κB (Fig. 4⇓B, lanes 2 and 3 in the first row) but not with that of IRF-1 or p48 (Fig. 4⇓B, lanes 4 and 5 in the first row). These data together with the finding that the wild-type GAS/κB or the wild-type ppκB oligomer competed out the C1 complex formation efficiently (Fig. 4⇓B, lanes 6 and 8 in the first row), suggested that p65/p50 was induced to bind to the region within −171 to −144 upon TNF-α stimulation. In contrast, formation of the C2 complex was not disturbed by anti-p65, anti-p50, or anti-p48 (Fig. 4⇓C, lanes 2, 3, and 5) and was not competed out with the GAS/κB or ppκB oligomer (Fig. 4⇓C, lanes 6–9). In fact, the C2 complex was competed out with the wild-type, but not the mutant, form of ISG54 (Fig. 4⇓C, lanes 10 and 11) and was supershifted with the Ab against IRF-1 (Fig. 4⇓C, lane 4). Therefore, we conclude that the C2 complex is composed of IRF-1 or an antigenically related molecule that could bind to IFN-stimulated response element (ISRE). EMSA with the nuclear extracts from cells unstimulated or stimulated with IFN-γ and TNF-α. 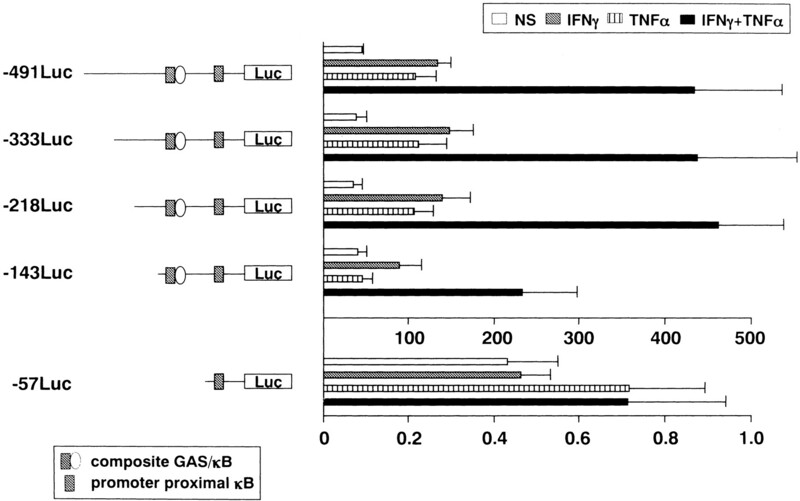 A, The nuclear extracts from the cells unstimulated (lane 1) or stimulated for 3 h with IFN-γ (lane 2), TNF-α (lane 3), or both (lane 4) were incubated with the radiolabeled probe corresponding to the region from −183 to −137 of the IRF-1 promoter. Similar results were obtained in three independent experiments using different batches. B and C, In the competition experiments, the following nonradiolabeled oligonucleotides were added in a 10-fold excess to the binding reaction: WtGAS, wild-type GAS/κB (lane 6); MtGAS, mutant GAS/κB (lane 7); WtNF-κB, wild-type ppκB (lane 8); MtNF-κB, mutant ppκB (lane 9); WtISG54, wild-type ISRE of ISG54 (lane 10); and MtISG54, mutant ISRE of ISG54 (lane 11). Abs against p65 (lane 2), p50 (lane 3), IRF-1 (lane 4), or p48 (lane 5) were added to the binding reaction. The TNF-α-inducible complex and the IFN-γ-inducible complex are indicated as C1 and C2, respectively. Please note that the C2 complex appeared just below the nonspecific band in an IFN-γ-dependent manner. The appearance of this nonspecific band was not reproducible, as shown in Fig. 4⇓C in the row of TNF-α stimulation. The single and double asterisks indicate the supershift signals induced by the anti-p65 Abs (lane 2) and by the anti-p50 Abs (lane 3), respectively. Similar results were obtained in other independent experiments using different batches of the extract. To locate the sequences recognized by p65/p50 subunit and the IRF-1 precisely, we performed a methylation interference experiment. Briefly, a radiolabeled probe corresponding to the region between −183 and −137 was partially methylated on the guanine residues and was incubated with nuclear extracts from the cells stimulated by IFN-γ and TNF-α. 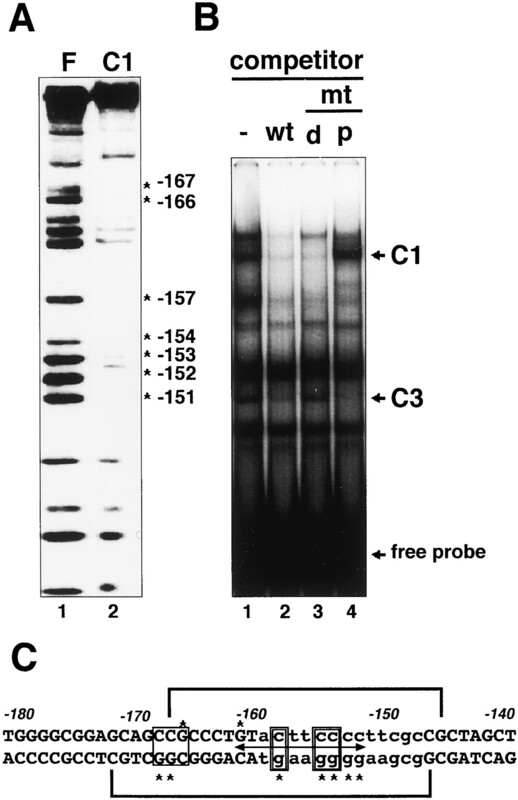 The DNA-protein complexes were separated by native gel electrophoresis, and after C1 and the free probe were identified by phosphorimage analysis, the complexes were recovered from gel slices. The protein-bound DNA was purified, cleaved by piperidine, and then resolved by a sequencing gel. Unfortunately, the C2 complex was not sufficiently resolved to perform this analysis, and so the detailed binding site of the IRF-1 remained to be defined. With regard to the C1 complex, the methylation of the G residues of the noncoding strand, at positions −157, −154, −153, −152, and −151, interfered with complex formation (Fig. 5⇓A). The G residue of the coding strand at position −160 was also critical for C1 complex formation (data not shown). Remarkably, the nucleotide sequence of the noncoding strand of this region, 5′-GGGGAAGTAC-3′, strongly resembles the consensus NF-κB-binding sequence (Fig. 5⇓C), suggesting that this region is the target for the p65/p50 subunit induced by TNF-α stimulation. Determination of the sequence recognized by the TNF-α-inducible factor. A, A methylation interference assay was performed as described in Materials and Methods with the IFN-γ/TNF-α-stimulated nuclear extracts and the partially methylated probe corresponding to the region from −183 to −137 of the IRF-1 promoter. After separation on a nondenaturing gel, the probe DNA was recovered from the free-probe band (lane 1) and the C1 complex (lane 2), cleaved in the presence of piperidine, and then analyzed on a sequencing gel. The asterisks represent the positions of the nucleotides critical for the formation of the C1 complex on the noncoding strand. B, EMSA was performed as described in Fig. 4⇑ with the nuclear extracts from cells stimulated by IFN-γ and TNF-α for 3 h in the absence (lane 1) or the presence of 10-fold molar excess amounts of nonradiolabeled wild-type probe (lane 2) or mutant oligonucleotides containing C to A substitutions at −167 and −166 and a G to T substitution at −165 (dmt; lane 3) or containing C to A substitutions at −157, −154, and −153 (pmt; lane 4). The TNF-α-inducible complex and the constitutive complex are indicated as C1 and C3, respectively. Similar results were obtained in three independent experiments. C, Summary of DNase I footprint and methylation interference experiments. The brackets above and below the nucleotide sequences indicate the regions protected from DNase I digestion on the coding and the noncoding strand, respectively. The arrows between the sequences indicate the region of the promoter-distal κB site. The asterisks indicate the nucleotides critical for the formation of the C1 complex identified by the methylation interference assay. The single- and double-boxed nucleotides were converted to C↔ A and G↔ T for the dmt and pmt oligonucleotide competitors, respectively. Lowercase letters indicate the ISRE-like sequence. To assess this possibility, an EMSA was performed with the oligonucleotide containing C to A substitutions at −157, −154, and −153 as a competitor (Fig. 5⇑B, pmt). The C1 complex formed in the IFN-γ/TNF-α-stimulated nuclear extracts was efficiently competed out by the wild-type competitor (lane 2), but not by the mutant competitor (lane 4). These results indicate that the region from −160 to −151 is recognized predominantly by the p65/p50 subunit induced upon TNF-α stimulation. Interestingly, methylation of the G residues, at positions −167 and −166 of the noncoding strand and at position −165 of the coding strand, also interfered with DNA-protein complex formation (Fig. 5⇑A and data not shown). In the EMSA, the oligonucleotide mutated at −167, −166, and −165 (dmt) still worked as a competitor for C1 complex formation (Fig. 5⇑B, lane 3). There was a complex that was not competed out by this dmt oligonucleotide (Fig. 5⇑B, lane 3), but was competed by the wild-type and the pmt oligonucleotides (lanes 2 and 4). This complex, which we termed C3, was observed even in the absence of the cytokine (Fig. 4⇑). These results indicate that the region from −167 to −165 bound a factor(s) that is present constitutively regardless of cytokine stimuli. To characterize the DNA-protein complex, we performed a kinetic study after cytokine stimulation with or without cycloheximide, a protein synthesis inhibitor (Fig. 6⇓). The C1 complex was induced 30 min after the stimuli (lane 2) and maintained the same intensity up to 3 h (lanes 4, 6, and 8). Cycloheximide did not affect the complex formation (lanes 3, 5, 7, and 9), supporting the idea that the C1 complex was composed of a pre-existing NF-κB subunit. In contrast, the intensity of the C2 complex became stronger in a time-dependent manner (lanes 2, 4, 6, and 8). In addition, C2 complex formation was inhibited by cycloheximide treatment (lanes 3, 5, 7, and 9). The constitutive appearance of complex C3 was again confirmed with this kinetic study. The C3 complex was not induced by the cytokine stimuli and was not affected by cycloheximide (lanes 1–9). Kinetics of the DNA-protein complex after stimulation with IFN-γ plus TNF-α. EMSA was performed as described in Fig. 4⇑ and demonstrated the kinetics of DNA-protein complexes C1, C2, and C3 after the stimulation. Cells were untreated (lane 1) or treated with IFN-γ plus TNF-α (lanes 2–9) for the times indicated. A protein synthesis inhibitor, cycloheximide, was added to the medium of the cells just before the stimulation (lanes 3, 5, 7, and 9). The quantitative data of the C2 complex are represented at the bottom. Similar results were obtained in two independent experiments. To assess the function of the newly identified κB site, located from −160 to −151 (promoter distal κB; pdκB), we introduced C to A substitutions at −157, −154, and −153 of the reporter plasmid −491Luc. 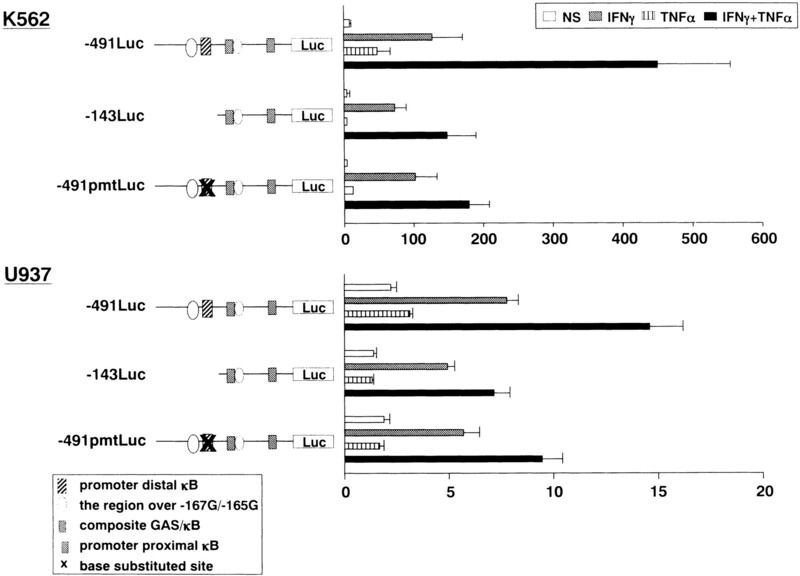 The resultant reporter plasmid, −491 pmtLuc, lost the response to TNF-α and reduced the synergism by costimulation with IFN-γ compared with the parental −491Luc (Fig. 7⇓). These data indicate that pdκB serves as an important element for the induction by TNF-α and the synergistic activation by both cytokines. Notably, the degree of the reduction in the cytokine responses of −491 pmtLuc was almost identical with that of −143Luc. Hence the element, between −218 and −144, which endowed the IRF-1 gene with the synergism to both cytokines, appears to be pdκB itself. Importantly, mutations in the region 5′-adjacent to the pdκB site (−491dmtLuc), generally weakened the ability of the promoter to respond to the cytokine stimuli. Thus, the region 5′-adjacent to the pdκB site is also required for an optimal response to the two cytokines. The pdκB site is critical for the IRF-1 promoter activation by TNF-α and IFN-γ. The structures of the IRF-1 promoter in the reporter plasmids are schematically indicated at the left, and the IRF-1 promoter activity of each reporter plasmid is represented as the mean ± SE from three independent experiments. Each reporter plasmid contains the following mutation of the −491Luc plasmid. −491 pmtLuc, the mutation of the proximal site of pdκB; −491dmtLuc, the mutation of the distal site of pdκB; −491 mtGASLuc, the mutation of GAS/κB; −491 mtGASpmtLuc, mutations of both pmt and GAS/κB; −491 mtNF-κBluc, the mutation of ppκB; −491 mtNF-κBpmtLuc, mutations of both pmt and ppκB. We next studied the functional relevance of the pdκB element in terms of cooperativity with the other cis-elements by introducing point mutations into pdκB, GAS/κB, or ppκB (Figs. 7⇑ and 8⇓). In the context of the native IRF-1 promoter, mutation of the pdκB or ppκB element resulted in a slight reduction of the cooperativity. In contrast, the mutation of GAS/κB (−491 mtGASLuc) produced a significant reduction of the synergism; however, a distinct additive effect was still maintained. Strikingly, the synergy/additive effect was abolished when the mutation was introduced to both pdκB and GAS/κB, or pdκB and ppκB (−491 mtGASpmtLuc or −491 mtNF-κBpmtLuc). Therefore, we concluded that not only GAS/κB but also the pdκB and ppκB elements are critical for the optimal response of the IRF-1 promoter to both cytokines. Next, we tried to determine whether pdκB is an independent enhancer or if it is dependent on the other element, GAS/κB, by using a heterologous promoter plasmid, pGL2-Promoter, where the luciferase gene is under the control of the SV40 early promoter. When we inserted four copies, but not the single copy (data not shown), of the pdκB region upstream of the SV40 early promoter (4pFL), a marginal response to TNF-α appeared. In contrast, insertion of the GAS/κB region (pWtGAS), but not the mutated GAS/κB region (pMtGAS), only resulted in a marginal response to IFN-γ. Finally, when the combination of GAS/κB and four copies of the pdκB region was inserted into the pGL2-Promoter (4pFL-WtGAS), a distinctive cooperative effect appeared. This effect was not seen when the inserted GAS/κB region was mutated (4pFL-MtGAS). Therefore, the pdκB element could function as a positive regulatory element in the presence of the GAS/κB element. The pdκB site cooperatively functions with GAS/κB in a heterologous promoter, the SV40 early promoter. The structures of the reporter plasmids are schematically indicated at the left, and the promoter activity of each reporter plasmid is diagramed as in Fig. 2⇑. ▪, SV40 early promoter. The solid arrow in 4pFL indicates four copies of the pdκB region. The dotted arrow indicates the region from −131 to −106 containing GAS/κB in the IRF-1 promoter. The reporter plasmids, pMtGAS and 4pFL-MtGAS, contain a T to G substitution at −121 and an A to C substitution at −114 in the inserted GAS/κB. The four copies of the pdκB region and GAS/κB were inserted in the same direction as in the IRF-1 promoter. To further examine whether the pdκB element was essential to the response of both cytokines in other types of cells, we used the U937 and K562 cell lines with the −491Luc, −143Luc, and −491 pmtLuc constructs. As seen with AS-E2, the point mutation or the absence of the pdκB elements resulted in a significant reduction of the promoter response to IFN-γ and TNF-α in both cell types (Fig. 9⇓). Thus, the essential role of the pdκB element in the synergism seems to be a general feature, rather than restricted to a specific cell type. The pdκB site is also required in the response to IFN-γ and TNF-α in U937 and K562 cells. The structures of the IRF-1 promoter in the reporter plasmids are schematically indicated at the left, and the reporter activity of each plasmid, calculated from three independent experiments, is shown as the mean ± SE at the right. Experiments were performed as described in Figs. 2⇑ and 7⇑. The importance of IRF-1 in many biological responses is now widely accepted. It has been suggested that not only deficient expression but also overexpression of IRF-1 results in a wide variety of pathological conditions (38, 39, 40). Thus, the transcription of IRF-1 gene expression should be strictly regulated in vivo. The expression of the IRF-1 gene is induced by many stimuli, including cytokines such as IFN-α/β, IFN-γ, TNF-α, and IL-1 (41). During a course of infection or other immunological responses, those cytokines are usually secreted primarily or secondarily in vivo as part of the cytokine network. In this study we chose IFN-γ and TNF-α, potent cooperative IRF-1 inducers in vivo, to stimulate erythroid progenitor cells, and used EMSA and DNase I footprint analyses to define the responsible cis-regulatory elements of the IRF-1 gene promoter. At first, we showed that the region between −218 and −144 as well as the downstream elements, ppκB and GAS/κB, were necessary for the response to the two cytokines by transient transfection experiments. Subsequent DNase I footprint analyses identified the pdκB region (from −171 to −144), which was inducibly protected from DNase I digestion when stimulated with TNF-α, but not IFN-γ, and the protection was significantly enhanced with the combination of these two cytokines. In EMSA with a nucleotide probe containing pdκB, the TNF-α-inducible complex C1 and an IFN-γ-inducible complex C2 were recognized. 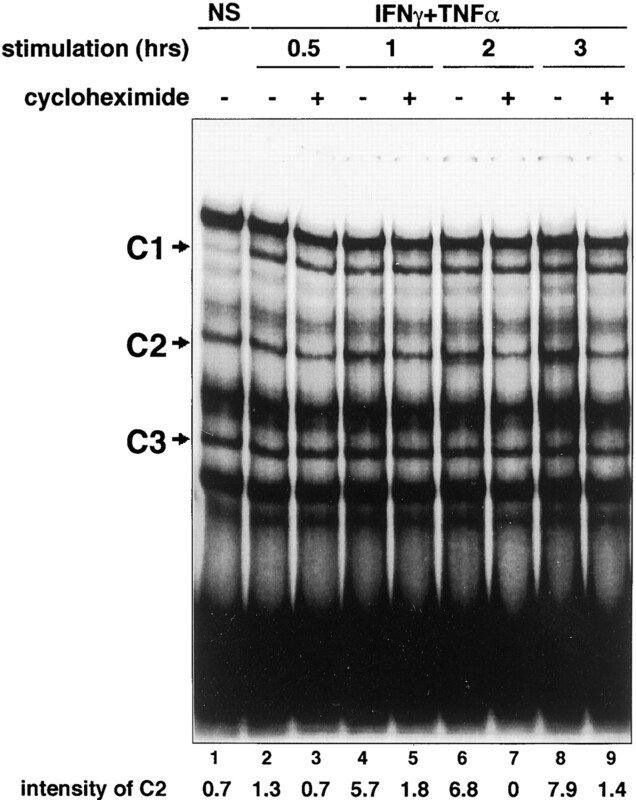 The kinetics and the effect of the cycloheximide treatment suggested that the C1 complex was composed of a pre-existing factor(s), while the C2 complex was composed of one or more factors that required de novo protein synthesis. However, neither the enhancement of the formation of these complexes nor the induction of additional complexes was observed by the stimulation with both cytokines. This apparently is in contrast to the enhanced footprint noted above. Further analyses were performed to determine the precise target sites of the transcription factors activated by the cytokines. The C1 complex, primarily identified as a TNF-α-inducible complex, consisted of the p65/p50 subunits, as judged by the effect of Abs against the subunits of NF-κB and the competition experiment. The methylation interference assay, using the nuclear extracts from the IFN-γ- plus TNF-α-stimulated cells, uncovered the critical G residues from −167 to −151 for the C1 complex formation. The 3′ half of this region, 5′-GGGGAAgTaC-3′ (from −151 to −160 of the noncoding strand), shows a high degree of resemblance with the consensus NF-κB-binding sequence, 5′-GGGRNNYYCC- 3′; the nucleotides deviating from the proposed consensus are indicated by lowercase letters (28). Because the base substitutions in this region (pmt) resulted in the loss of both the binding of p65/p50 and the TNF-α response, this newly identified κB-like motif, the pdκB element, serves as the target of NF-κB induced by TNF-α stimulation. Interestingly, the pdκB element also seems to contribute to the response to IFN-γ, because the base substitutions (pmt) reduced the IFN-γ response of the IRF-1 promoter as well. A partly overlapping sequence of the pdκB element, 5′-ACTTCCCCTTCGC-3′ (from −158 to −146 of the coding strand), shows homology to a cis-element termed ISRE, 5′-AGTTTCNNTTTCC-3′ (42). As the pmt mutation was introduced in the overlapped ISRE-like sequence, it seems reasonable that the responses to IFN-γ and TNF-α became reduced at the same time by this mutation. This IFN-γ-inducible factor must be IRF-1 or an antigenically related factor, because the C2 complex was supershifted with an Ab against IRF-1, but not with Abs against p65, p50, or p48. These data along with IRF-1 being a de novo synthesized IFN-γ-induced gene and an ISRE binding factor strongly suggest that the C2 complex is composed of IRF-1. Alternatively, the C2 complex is composed of a factor that is antigenically related to IRF-1 and also binds to ISRE. Although the precise nature of this IRF-1-related factor is presently unknown, it is plausible that IRF-1 itself contributes to the regulation of IRF-1, as previously suggested by Reis et al. (43). In contrast, the results reported by Sims et al. contradicted this mechanism (29). From our preliminary experiments, IRF-1 per se could bind to the ISRE-like element of the pdκB region; however, the binding seemed weaker than that to a consensus ISRE of ISG54 (data not shown). Further characterization of the nature of the C2 complex will resolve whether IRF-1 autoregulates the IRF-1 gene physiologically. The methylation interference assay also showed the importance of other G residues (−167 and −165) for C1 complex formation. In the EMSA, however, an oligonucleotide with this particular G residue mutation (dmt), but not the pmt mutation, still served as a competitor for C1 complex formation. This indicated that the p65/p50 heterodimer had a critical role in C1 complex formation, and without it, the binding factor(s) to the region over −167G/−165G was not enough to maintain the complex formation. However, this factor or another factor(s) recognizing the region over −167G/−165G must be required for formation of the constitutive complex C3, because the band of the C3 complex was competed out by the wild-type and the pmt oligonucleotides, but not by the dmt oligonucleotide. Because the mutation in this region also resulted in the reduction of cytokine responsiveness in vivo, the presence of −167G/−165G-recognizing factor(s) might be required for the efficient recruitment of the p65/p50 subunit and/or the IRF-1-related factor. Therefore, the enhanced protection over the region from −171 to −144 seen in the synergistic response may reflect the cooperative action of the p65/p50 subunit with the constitutive factor and the IRF-1-related factor. The IRF-1 promoter contains two other cytokine response elements (12, 13, 29, 30), ppκB and GAS/κB, respectively. As previously reported, the importance of both ppκB and GAS/κB to the response to the cytokines was confirmed by DNase I footprint analyses (data not shown) and transient transfection experiments. However, critical elements in the optimal synergism seem to be attributable to all three cis-elements, ppκB, pdκB, and GAS/κB, because the mutation of any site by the 5′ deletion or base substitutions reduced or abolished the synergistic induction of IRF-1 by IFN-γ plus TNF-α. The GAS/κB element was found to be the regulatory element that mediates the transcriptional synergism of IRF-1 induction in response to IFN-γ plus TNF-α (13). In this regard, the promoter of the IRF-1 gene is unique in having pdκB and GAS/κB sites, either of which is a target of both IFN-γ-inducible and TNF-α-inducible factors. Although the precise mechanism that mediates the synergistic response remains to be clarified, the cross-talk of these inducible factors on the above two targets must be an important aspect of this synergism in IRF-1 gene expression. It has been reported that the cooperativity between IFN-γ and TNF-α in the regulation of some genes occurs in a cell type-specific fashion (8, 44, 45, 46, 47). Thus, the newly identified cis-acting regulatory element, pdκB, could only function in the AS-E2 cell line. However, this might not be the case, as we confirmed that a similar, but less distinct, C1 complex was induced in the nuclear extract from HeLa cells stimulated with IFN-γ and TNF-α (data not shown). Furthermore, we confirmed that mutation of the pdκB element in the IRF-1 promoter resulted in reduction of the synergism in both U937 and K562 cell lines. Finally, it is worth noting that the nucleotide sequence of the pdκB region as well as those of ppκB and GAS/κB of the IRF-1 promoter are strictly conserved among species such as mouse, rat, and human (29, 48, 49). We speculate that the pdκB region together with ppκB and the composite GAS/κB evolved to achieve maximal induction and/or fine-tuning of IRF-1 gene expression in response to various cytokines in vivo. We are grateful to the Human Genome Center (Institute of Medical Science, University of Tokyo, Tokyo, Japan), and Kirin Brewery (Tokyo, Japan) for providing materials, and to Drs. A. Koda, H. Ichinose, and M. Miyazaki for encouragement. 1 This work was supported in part by Grants-in-Aid for Scientific Research from the Ministry of Education, Science, Sports, and Culture, Japan, and by a grant from N.D.R. Corporation (Gifu, Japan). 3 Abbreviations used in this paper: IRF-1, IFN regulatory factor-1; JAK, Janus family tyrosine kinase; GAS, IFN-γ activation site; IκB, inhibitor κB; ppκB, promoter-proximal κB; pdκB, promoter-distal κB; Epo, erythropoietin; ISRE, IFN-stimulated response element; ISGF3, IFN-stimulated gene factor-3; ISG54, IFN-stimulated gene encoding a 54-kDa polypeptide.